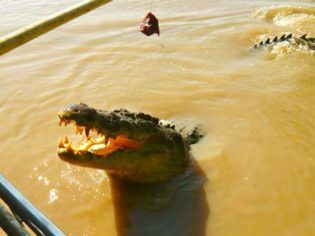 The eyes do not look like they are on the cheicken... scary times at croc jumping on the Adelaide River. “Tell me you’re not,” snorts my mate Graham, a Territory resident of five years. “It’s a bloody circus, Jen.” He adjusts his glasses, shakes his head and scans the crowd at Darwin’s Roma Bar cafe. “Are you… checking to see who heard me say that?” I ask indignantly. What’s so bad about a little tourist activity in my newly-adopted home town? “Croc jumping is a ride. And you can only do it in the Northern Territory,” my boss Alice had urged the previous month. She’d drawn me a map of the Darwin-Kakadu loop, marking ‘must-dos’ with an insistent, scrawled star. First non-missable item: this croc-jumping tour, in the Adelaide River catchment – home to one of the world’s highest concentrations of saltwater crocodiles. Yup, the casually humungous kind. Mentally torn between enthusiasm and disdain at today’s distinctly touristy activity, I arrive at croc central on a Sunday afternoon in dry, 30-degree heat. A painted sign sits propped between two orange plastic chairs, pointing to parking. Two tourists with tanned arms whisper in the shade. “You’re on a small boat today; there’s only 10 of you. And you’ve come at the best time. The tide’s low so there’ll be crocs baking on the river beds,” says my friendly South African host, running an old-fashioned manual slide over my credit card. A perfect 10 ‘croc’ jump on the Adelaide River. She’s a modern day Linda Kozlowski I decide, waiting to catch sight of her Mick Dundee. Instead I spot the ‘penthouse’, a two-storey staff hut. The thing looks like it’d blow over in a gentle breeze. There’s a small jetty visible through the shrubs and I wander out for a view of the river. I see one! A croc! Its marble eyes and long snout lift out of the khaki water. It’s looking STRAIGHT AT ME. I holler for my travel companion to check-this-the-frig-out. “Oi, you guys, step away from there please. That’s meant to be cordoned off.” Dundee’s got a gap-toothed smile, tufts of curly red hair, and, disappointingly, the name ‘Morgan’ stitched on his shirt. “Ready to croc n’ roll?” says Kozlowski, without a hint of irony. Taking my seat up front, mild panic strikes. The boat’s a little sunken and passengers sit at water level. Separating us from the currents: a two-centimetre-thick metal grill. We amble around the first bend and spy a croc on the bank. The boat putts out into the open river. In waves, flocks of birds make an exodus from the trees. Fellow cruisers coo. This is a pretty spot. The monster from the deep ready for lift off. Morgan rams the boats in a messy nook of branches. We pause. “Here she comes. She’s a monster.” He hooks a palm-sized cut of meat onto a pole and dangles it over the edge. She slides towards us at full speed, snaps at the teasing hook, then lunges from the water – half her body in the air. A flurry of broken, yellowed teeth and dead, glazed eyes swipe past the grill. The croc is close enough to touch – should you be partial to suicide. I won’t lie. I shriek like a baby. “Are they fighting? Is there a second one?” I’m semi-hysterical, pointing at a tail slapping five metres from the mouth. “It’s the same one. She’s almost six metres. Don’t lean out of the boat, people!” says Morgan, eyeing a French backpacker zoning out behind her Raybans. A child buries his face in his father’s legs. Ho-ly crap. Six crocs later, our boat drifts to a stop. “You haven’t got a spare pair of undies, do ya?” asks the man with tanned arms. I grin. That was thrilling, freaky fun. I make a mental note to chastise cynical Graham. Circus? Mate. This is a jungle. Where: 70km from Darwin CBD, off the Arnhem Hwy. Notes: $45 for a one-hour cruise. Runs four times daily from mid-May until late October. To avoid the crowds and join a smaller boat, choose a 9am or 3pm cruise.